Imagine a relaxing, immersive day designed with busy women in mind. A unique experience for you to refresh, reconnect and reawaken. Pause for a moment and paint a picture in your mind of a beautiful Barn, Pavilion, Manor house all prepared and decorated for ultra-special day. Maybe you can hear the quiet communication of women as they laugh and learn together. You stop and admire the peaceful gardens, the sense of space and calm that the gorgeous venue that Field Place offers. You take a deep breath as you arrive and the gentle tingle of anticipation and excitement bubbles in your tummy. You are so very glad you choose to prioritise yourself today. You surround yourself with gentle giggles, “AHA” moments, contagious inspiration and a deep sense of joy floods through you as you realise you are participating in something unlike anything you’ve ever experienced before. You can’t quite believe this is in Worthing. Finally, an event curated to bring together all the wise and wonderful wellbeing women of the South East. As you stroll from a workshop to a lively topical discussion taking place in a luxury Bell tent, perhaps stopping to enjoying some Yoga or creative mindfulness, trying one of those activities that you’ve never quite got around before now. Experimenting with festival style flower crown making, making natural beauty products or Qoya, you get the drift…. Finding a comfortable warm place to bask in the Autumn sunshine and take time to reflect on the wonders of the world. You connect with your inner-self that might have long been forgotten. You get a sense of the “old” you as you take time for yourself for a change. You might come with friends or female family members but you’re in a beautifully friendly place if you don’t. You make new like-minded connections effortlessly as women join in wellness & kindness. You simply enjoy each other’s stories and company. 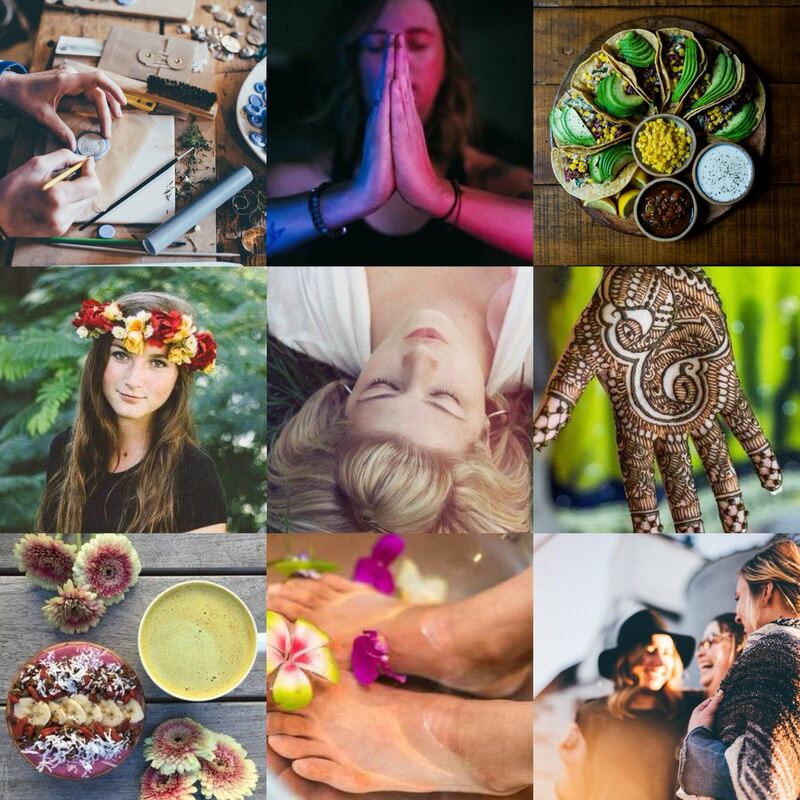 The energy is high and the excitement within you literally crackles as every cell in your body enjoys this combination of a one day retreat and well-ness festival for women. You marvel at the feminine celebration of health, wellness, relationships, fun, creativity, self-empowerment and prosperity. Enjoying the Being-Well Mini Market, you soak up the vibe with wonder as your wander around local stall holders displaying their beautiful wares. Natural & organic beauty, funky yoga wear, handmade jewellery, the best quality essential oils, locally made food products, environmentally friendly items, the local experts in fitness, health, therapies and coaching to guide and support you and you are drawn to everything you need in that moment. As you’ve chosen to upgrade your experience you also enjoy an amazing array of brunch & lunch buffets and endless soft refreshments in the private catering rooms with comfy bean bags to sit back, enjoying nourishing your body and you chillax in your mind. When it’s time for your treatment you disappear to the lux pop-up Spa area where you are welcomed by one of our highly trained and skilled therapists – you’ve pre-chosen a time slots and selected a beauty or therapeutic treatment and slip into a state of pure bliss as all your needs are attended to in that moment. Afterwards you float into different rooms and places attending all the talks that called to you. Maybe you meditate, perhaps you laugh, you will absolutely have transformative moments as you discover some new layers of you. When it’s finally time to leave, you drift away from your special day, Heart and Soul full of discovery and lightness, you glide back to reality, changed, uplifted and motivated. Feeling surer about who you are and what you need to flourish on-going. Your head is full of new information and an experience that invisibly supports you in feeling happier and even more contented. Restvial might feel like a dream but the ufloruish team are “on it” to bring you a memorable real experience to move you. Phase one is live now and spaces are limited. Please make sure you read the three ticket options carefully and select the right experience to indulge the little voice in your head, telling you that you deserve it. The voice is right you know! BRONZE* ticket holders will benefit from a whole day of General entry (unlimited, workshops and classes) + wellbeing goody bag. GOLD** ticket holders will enjoy a full upgraded VIP experience and receive very special treatment – general entry (unlimited talks, workshops and classes) + one 25min beauty / therapeutic treatment + super upgraded wellbeing goody bag + Gourmet (veggie & vegan) food & refreshments + 90 minute private Hypnotherapy / life coaching session + access to VIP only chill out zone / Special private Q&A sessions with the guest speakers & workshop hosts. * Bronze tickets do not include any catering. The on-site gourmet caterer will be supplying a lunch menu for pre-order at additional cost closer to the time which is optional. If you choose to bring your own lunch the venue have clearly specified that it is not permitted to be eaten within the venue. There are a convenient parade of shops directly opposite the venue. **The 90min Life Coaching / Hypnotherapy session will be arranged for a time after the event at the uflourish clinic based in Worthing.